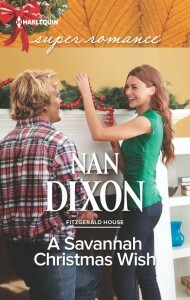 I’m so excited A SAVANNAH CHRISTMAS WISH is finally out in the world. This is Book 2 in the Fitzgerald House series. This is Bess Fitzgerald’s story. She’s a landscape architect, but loses her job and her apartment on the same day. Somehow she always seems to loses everything she loves. She must figure out how make a living, find a place to live and tell her family. To celebrate the release, I’m running a Giveaway for the month of December for a $50.00 Amazon Gift Card. The Fitzgerald sisters share mulled wine on Christmas Eve. What food/drink says Christmas to you? non alcoholic low fat EGGNOG!! Tee hee. A lot of people have said Eggnog. I’m more a Tom and Jerry kind of person! Thanks for stopping by, Ron! I love hot apple cider. I add orange juice, cloved orange slices, cinnamon sticks and a little brown sugar! Then I leave it in the crock pot! Oh yeah! That is Christmas!! Thanks for stopping over Amanda! Oh I have to say for us its Hot Chocolate with marshmallows! Always wonderful warming up by the fire! Applesauce cake sounds wonderful! Thanks for stopping by, Kris!